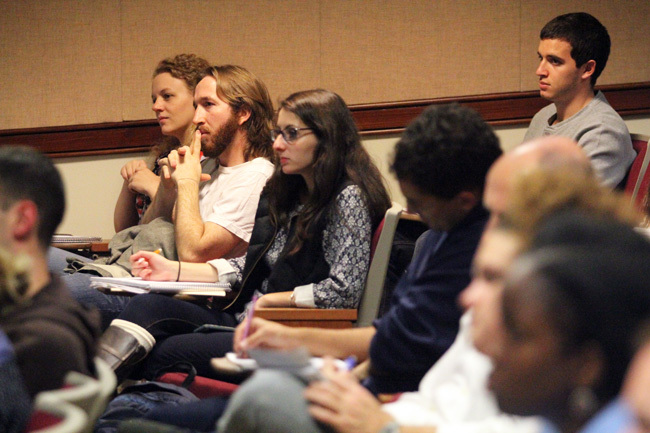 Villanova students and other guests listen to the presentations. 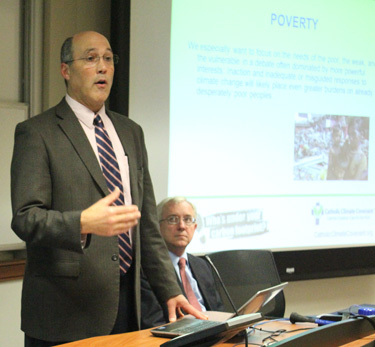 Daniel J. Misleh, the executive director of the Catholic Climate Covenant, alerted his audience to the church’s mission to care for creation. Misleh said he initially learned about climate change through his oldest child, and the subject interested him enough to study it further. In 1990 Pope John Paul II issued a statement on climate change for that year’s World Day of Peace. The Catholic bishops of the United States also made comments on the subject in 2001 by emphasizing prudence and focusing on the environment’s effects on poverty. Misleh anticipates Pope Francis issuing an upcoming encyclical on climate change. In his talk, Misleh said the poor usually provide the least carbon footprint yet endure the effects of climate change the most. Ken Fleischer, who teaches a class titled “Faith, Reason and Culture” at Villanova, attended the talks and invited his students to write a paper on environmental ethics. He called climate change an ecological challenge. Dan Misleh of the Catholic Climate Covenant speaks about Catholic teaching on climate change, the environment and global solidarity. 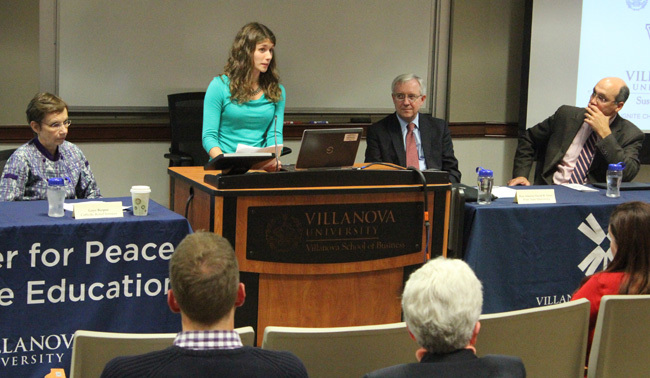 Rear Admiral David Titley, the founding director of the Center for Solutions to Weather and Climate Risk at Penn State University, spoke in his talk about the environment’s effect on national security. He condensed his message into three simple points: It’s about people. It’s about water. It’s about change. Titley said his military superiors initially asked him to get educated on the issue. The retired admiral, who said he is just one of a few senior military officers involved in climate change, noted the issue often appears “complex and abstract” but it’s important nonetheless because people can make a difference in the field. He used animated graphics and charts to emphasize rising global temperatures. Due to escalating sea levels, Titley noted 3.7 million people in the United States are within three feet of high tide. He said melting ice in the Arctic Ocean causes concern for the United States because other nations might attempt to claim waters and surrounding lands in the future, impacting the United States’ claims in Alaska. Gaye Burpee, Catholic Relief Services’ senior adviser on climate change and rural livelihoods for Latin America and the Caribbean, spoke about climate change’s effects on agriculture in Central America. She said crop yields for maize and beans are expected to decrease because of climate change, caused by rising temperatures and less water for irrigation. Burpee said climate change also produces more frequent, intense and damaging rains in Central America, which destroy or damage crops and the homes of farmers. Liesel Schwarz, the sustainability manager for Villanova University and organizer for the panel discussion, said much talk today in the United States focuses on the economy but more emphasis should be put on the environment and its effect on the economy. “We’re so insulated because of how developed we are,” Schwarz said. Charlie Dugan, another attendee who has been interested in the topic for 15 years, said the seminar presented a lot of new information. He thought Burpee’s talk gave a detailed study. Brendan Monahan is a freelance writer in Plymouth Meeting and may be contacted at bmonahan16@gmail.com. 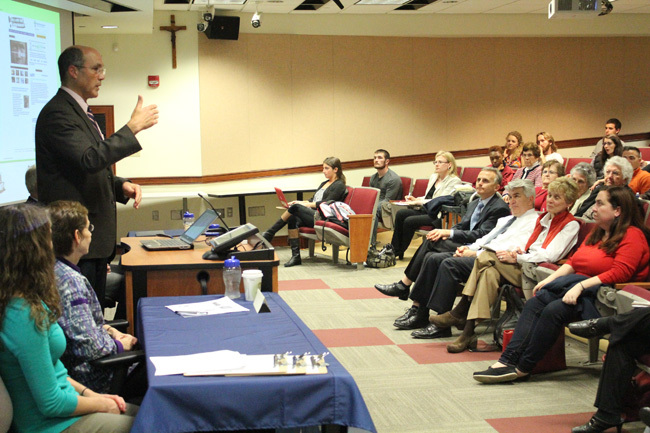 Dan Misleh addresses the approximately 40 attendees at the panel discussion on climate change Nov. 121 at Villanova University. I have been listening to the Climate Liberal Lies since the 1st Earth Day at Belmont Plateau. Then it was GLOBAL COOLING. Jacque Cousteau maritime friends spoke about the Oceans and warned about being able to walk to France from Philly because the seas would turn to molasses and harden. Then it was we were destroying the coral reefs off the Atlantic Coast. Environmentalist dump millions of tires to create an artificial for the fishes to play.OOPS That is now an environmental Catastrophe. the science was settled they claimed on all those events. Then it was the OZONE. We stopped manufacturing CFC to close the hole we never realized was there ALWAYS! You guessed it the hole is still there..False Alarm. Then it was Al Gore telling us Arctic would be ice free by 2012 Professor Mann of PSU proclaimed his Hockey Stick in Increased temperatures weather Patterns EXCEPT he has been in Court for more than a decade trying to not release the Raw data and logic for PEER REVIEW. hmmm Thats strange.. In 2014 the Arctic Ice cap is the largest and Thickest in History. Same goes with the South Pole. Environmentalist send Ozzies to South Pole In Summer to document there findings except they get stuck in Ice, meanwhile Russia and China Ice Brekers get stuck in ICE> USA who clears the North South Lanes for scientific and Supply Ships rescued the Environmentalist. The Now Named Climate Change Liberal Environmentalist crew is just trying to Bully Their HOAX thru UN. They WANT Control.. Just Like They lied about TREES before You can’t cut them you can’t clear brush around Trees in late 1990’s early 2000’s until reality set in that older trees don’t cleanse CO2. The Younger trees thrived in CO2 by naturally growing deeper roots to compensate. The Environmentalist RELIGION is mother nature. What they ultimately want is COMPLETE CONTROL.of our Lives! The Environmentalist Climate Change computer models cannot take past history input real data and Predict the already KNOWN past. However they Call us Radical because we don’t embrace their UNTRUTHS! The US Government declares CO2 a Pollutant that without it we would all DIE! They declare a Minimal level of 400 PPM while our Lungs Contain over 40,000 PPM of CO2 . What a Quandry? Do we blame GOD for making us incorrectly? If this is a sin in Churches Eyes for Violating this UNJUST Regulation, and not rendering onto Caesar> WHO do we believe? Imagine Jesus Christ was Lucky he didn’t live in 2014 in USA. There is one single industry destroying the planet more than any other. But no one wants to talk about it.